Editor’s Note: This article was originally published by Myk Pono on The Startup, a Medium publication. The below is an excerpt from the post. You can read the full article here. This article will walk you through the customer acquisition funnel for SaaS companies. The primary goal is to help you design, analyze, and optimize your customer acquisition process. The secondary goal is to present different perspectives on moving customers through the lifecycle stages and to show how marketing, sales, and customer success teams should collaborate and where each team’s responsibilities lay. Hopefully, everyone will find at least one useful idea to try or to test. The effectiveness of your customer acquisition funnel can be tracked by metrics that measure leakages when moving prospects from one stage to the other. The process of handing over prospects from the marketing to sales team and from the sales to customer success team presents higher than average risks of losing prospects, missing data, or miscommunication between teams about responsibilities, definitions, and success metrics. Content strategy is one of the most effective ways for companies to increase the velocity with which prospects move from one stage to the other. As we go through each step in the funnel it will become clear why it is crucial to analyze content strategy from a customer lifecycle perspective. In favor of simplicity, the customer acquisition diagram is missing the reference to target customer profiles, product positioning, and value messaging. These three topics require a separate discussion. Other pieces that are missing in this diagram are Customer Acquisition Cost (CAC) and Customer Lifetime Value (LTV). Again, this information was omitted for the purpose of clarity. The customer acquisition funnel is a process of tracking and monitoring how effective the company is in attracting, engaging, converting, and retaining its customers. Before we dive into the detailed discussion, let me answer a couple of questions. 1. 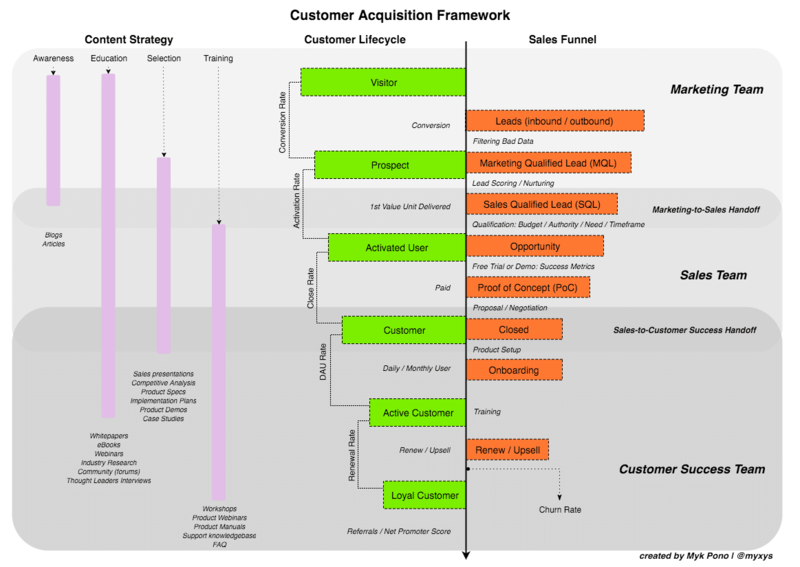 Will this customer acquisition framework fit my SaaS company? The Customer Acquisition Framework presented below is just ONE of the ways for a SaaS company to track customer acquisition effectiveness. Obviously, Slack’s customer acquisition strategy will be different from the one Salesforce uses. Companies with similar business models, product prices, and average deal size will have similar customer acquisition funnels. Please adjust and adapt this approach to fit your specific needs. 2. 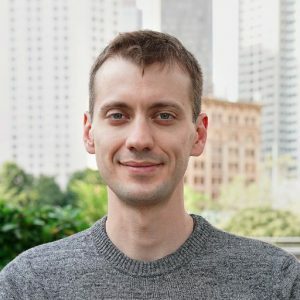 Why create another Customer Acquisition Funnel? Many experienced investors, founders, and marketers have already written about customer acquisition funnels, SaaS sales cycles, SaaS metrics, and content strategy. Why do we need yet another customer acquisition funnel? 3. Why is this framework missing X? The goal for this framework is to provide comprehensive information that is easy to digest. My hope is that people working in SaaS businesses will look at this diagram, see things in a different perspective, and then take these ideas and optimize their customer acquisition process. For example, the content strategy part of the diagram assumes that your company has clear messaging and positioning for your product. In other words, you have in-depth target customer profiles that your team uses to understand each of the different players in the buying process and the customer value they get from your product. Read more on how to create target customer profiles and effective value messaging. Customer Lifecycle helps companies understand how customers are experiencing your product and what actions they are taking. Sales Funnel shows internal processes that companies need to follow in order to move prospects down the funnel effectively and efficiently. The diagram shows that the sales funnel is shorter than the customer lifecycle. For companies that track both, the sales funnel is just one part of the overall customer lifecycle journey. If we only discuss the Sales Funnel part of the Customer Acquisition Framework, it’s easy to forget that customers look at your product differently and there are multiple paths to conversion. The sales funnel is used by organizations to analyze how effectively they move prospects through the sales pipeline. 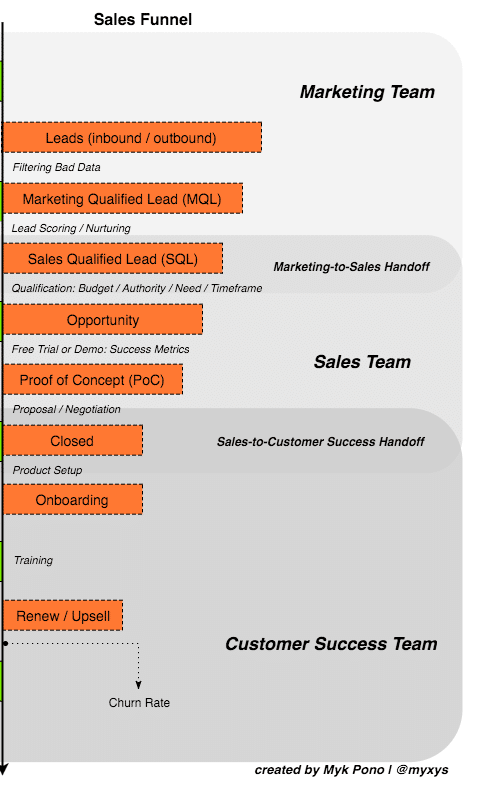 Sales funnel stages represent a prospect’s current stage as the company sees it. As a prospect moves down the funnel, the probability of closing the deal increases. For example, a company may know they have a 30% probability (based on past sales) of closing a prospect once they reach the opportunity stage. They use this probability when doing sales planning and modeling. If they currently have $500,000 in opportunities, then they have a potential for $150K in closed business. NOTE: If you are doing sales planning, you need to take into account the average time it takes to move a prospect from the opportunity stage to the closed stage. Using the example above, if it takes an average of 60 days to close an account after it becomes an opportunity, the company can forecast a revenue of $50K net 30 and the remaining $100K net 60. Customer lifecycle is a framework that puts the customer at the center of the process and looks at how they move along the buying process. It provides insights on customer’s actions that identify an increased probability of buying your product. For companies that have a freemium business model, the customer lifecycle funnel is more important than the sales funnel. A great example of this is Slack, which offers their basic service for free, but converts free customers into paid customers by offering additional features. Obviously, a sales funnel with MQLs and SQLs isn’t tracked at Slack since their bottom-up approach to customer acquisition eliminates this need. Finally, it’s important to remember that the higher the product price, the more emphasis companies should place on monitoring sales cycle. For example, Salesforce’s free trial isn’t as useful as Slack’s since their product is too complicated and needs significant resources to be integrated. Therefore, following the internal sales funnel makes more sense. The Customer Lifecycle is often drawn as a circle, but in this case we use a vertical representation to make it easier to visualize the relationship between the customer lifecycle and sales funnel. There are six stages the customer has to go through in order to “complete the circle”. Each transition between stages corresponds with a direct action that customer has to do or achieve. Think of this process as different levels in a video game. To become a visitor, somebody needs to visit your company’s website. When they submit a form or sign up for a free trial, they become a prospect. Prospects then become activated users when value is delivered or a certain level of usage is reached. Let’s quickly go over each stage. Visitor is a very broad category that includes everyone who lands on your website. In theory, every visitor is a potential customer (not really). When a visitor signs up for a free trial or downloads something (e.g., case study, ebook, etc. ), they become a prospect. A visitor becomes a prospect once they convert on a website. A prospect is a potential customer who has expressed interest in the pains, solutions, products, or materials related to your company. The contacts on a list that your marketing team might buy from a third party are not prospects since they haven’t actively expressed interest by sharing their information nor have they been qualified by your sales development team. The conversion rate, in a sense, tracks the effectiveness of your website and content. Overall, the conversion rate for your website is a more generic metric (and can be ignored), but the conversion rate for free trial and product signups pages are more explicit and actionable. Not tracking user activation during the initial signup or a free trial is one of the most common mistakes SaaS companies make. They are focused vastly on getting customers into the product that first interaction with the product becomes an afterthought. Tremendous resources are spent to get prospects in and even more resources should be allocated to designing the first experience and getting prospects to the aha-moment when first value is delivered. The primary goal after getting a prospect inside your product is to activate them by delivering the core value unit for the first time. You entice the prospect to reach your pre-defined activation level. As discussed in The Cost of Poor User Onboarding, Slack user activation happens when a team chat reaches 2000 messages. Subscription billing: connecting your payment options or bank account can be used to activate a user. Platform connecting farmers, distributors and chefs: activation can be tracked when a first order is placed. Airbnb: an activated user could be a new visitor that saves their first listing. Lyft (yes, I’m rooting for the underdog! ): an activated user could be one who connects a credit card to the app. The activation rate is a ratio to track how effective the company is in delivering first value and designing the first experience with the product. Activation rate simple shows the percentage of prospects who actually activate their free trial and received a first value unit. NOTE: It can be extremely challenging for a SaaS company to use a third party onboarding solution. User-onboarding is such a critical step that it’s almost impossible for someone outside of your company to design a product that perfectly meets the needs of your customers. Your product team needs to own it. Do all of our customers use our product regularly? Are they happy with how much value your solution delivers? Your customers can pay for the product but not use it very often or at all. An active customer is one that regularly uses your product and therefore receives value and installs habits of using your solution on a regular basis. SaaS companies need to identify what usage correlates with high Lifetime Customer Value and a higher renewal rate. When a customer renews or signs up for additional features (e.g., extra seats or API access), they become a loyal customer. The customer lifecycle helps you understand how customers experience your product and company. It’s a customer-centric approach in which customer action drives the funnel. Each stage that a customer goes through is preceded by a specific action. Effectiveness of each stage needs to be tracked and optimized with conversion metrics. For products that have free trials, it’s crucial to track ‘Activated Users’. This metric is an important checkpoint for measuring intermediate steps between the ‘prospect’ and ‘customer’ stages. Companies need to know how often customers use their product/solution and how much value they derive from it. Buying decisions for larger companies are rarely done by one person. Because of this, the “Customer Lifecycle” refers to everyone (i.e., whole account) involved in the purchase and use of the product, not just one manager or one end user. A company can request case studies and referrals from a customer as soon as it make sense. Make sure that the customer receives consistent value before asking for a case study or referrals. The customer should be at least an active customer. Whereas the customer lifecycle is driven by customer actions and tracks how they experience the product and company, the ultimate goal of the sales funnel is following specific actions, processes, and workflows to track and optimize the sales process effectiveness. How does your team prioritize leads? How does your team nurture prospects? What prospect actions correlate higher with closed deals? How long does it take for your SDR team to reach out to leads that reach a qualifying lead score? What metric best represents efficiency of moving prospects from one stage to the next? When and how do your teams handoff prospects in the funnel? Do you have an onboarding plan? Let’s take a closer look at the sales funnel. Leads can enter the sales funnel from outbound and inbound channels. Outbound leads are leads created by Sales Development Reps (SDRs) by carefully targeting accounts that may have never heard about the company. Outbound email outreach is still one of the most effective tactics for generating outbound leads. Cold calls, direct mail, sending messaging on social media are all part of the outbound channel. LEARN MORE: get everything you need to know to start outbound sales for your startup with Steli Efti’s ebook — “The Ultimate Startup Guide to Outbound Sales”. Inbound leads are leads created when prospects submit information in exchange for an asset (whitepaper, case study, etc.) or signs up for a free trial. NOTE: In account-based selling approach where SDRs pre-qualify accounts before initiating an outreach prospects that showed interest can be assigned to Sales Qualified Lead (SQL). Not every lead is created equal so it pays to have some sort of lead scoring system that correlates with the historic probability of closing a deal. Lead nurturing campaigns help companies communicate with prospects. Educational content is a great way to nurture leads. Drip campaigns, newsletters, and webinars can help your marketing team qualify leads and understand when they are ready to discuss their specific problems with you. As soon as prospects hit a certain lead score they are moved to the Sales Qualified Leads stage. LEARN MORE: In some cases MQL could be completely abundant. Tom Wentworth makes an interesting point about this in his article “Why I’m Killing the Marketing Qualified Lead”. My take on this subject is this: if your average deal size is large or your solution can’t be self-trialed by customers, then generating leads using marketing assets can still be effective. But if you are selling a self-serving solution like Slack, Dropbox or Google Apps, then you can drive customers directly to your product and skip lead forms. However, you still need to find a way to nurture and prioritize people coming through your product gates.Another interesting take on this topic by David Cancel and Dave Gerhardt from Drift — “Why We’re Throwing Out All Of Our Lead Forms And Making Content Free”. Action required to move to the next stage: Lead score reaches the level needed to be moved to the SQL stage. At this stage, a sales development team conducts lead qualification. The qualification process depends on your target audience and it should provide your sales team with enough information to establish the level of pain or interest that the prospect has. The BANT framework can be used in qualification process. The BANT stands for Budget, Authority, Need, and Timeframe. NOTE: We need to also mention that if a company sells a complex solution or multiple people are involved in the purchasing process (decision maker, influencer, end-user), then a good qualification process will identify the goal and value points for each party involved in the buying process. Decision makers in two different companies might look to solve two different problems and your account executive will have more ammunition if the SDR can identify these differences. Action required to move to the next stage: The SDR qualifies prospect using BANT approach. When a lead passes all the necessary qualification parameters, it becomes an opportunity. The SDR will schedule a demo between the prospect and account executive. It’s a very useful practice to assign a dollar amount based on the projected deal size for every opportunity. Doing this will help the SDRs to be become more skilled at qualifying and targeting outbound accounts. It’s also a good idea for account executives to prioritize opportunities based on deal sizes. The account executive gives a demo to the prospect and setups a guided free trial. Getting customers to agree on specific metrics to measure the success of a free trial can increase the probability of closing and reduce the length of the sales cycle. Action required to move to the next stage: Completed demo or guided free trial. The higher the deal size, the more important the proof of concept becomes in the sales process. For fully self-serving products, it’s easy to show a demo and give full access to the solution for a prospect to play with. But what if your product requires integration with third party data platforms? Since setting up a trial period for a more complicated product requires extra resources from your team, the account executive and the prospect should agree on how success will be measured and what the potential deal size will be if the trial is deemed a success. For technical products, a sales engineer can be brought into discussions with prospects. This is the funnest stage of all. The customer sends the signed proposal and pays for the first invoice. You ring the sales bells while everyone celebrates with champagne. But the real work actually begins now. The customer success team needs to train and fully onboard the customer so that everyone on their team can access your product. The customer success team (CST) leads the onboarding process by training customers on how to use your solution. In some cases, the solution will have different user roles and multiple levels of access which complicates the onboarding. Some companies run weekly product training webinars for all customers. During these sessions, the CST can walk the customers through the most common user path and showcase new features and changes to your product. Individual training with your customer’s inside team can be very effective. The onboarding process never truly ends. The top tech companies realize that a happy customer is cheaper to maintain than acquiring new ones. A top CST will schedule monthly or bi-weekly meetings to review customer’s metrics and check whether the product is fully meeting their needs. LEARN MORE: Lincoln Murphy has a few great articles on customer success and onboarding. He is an expert on customer success. The effectiveness of your customer success team is measured by renewal, upselling, and churn metrics. Typically, the customer success team starts the renewal conversation about 2–3 months before the annual contract is set to expire. But as we discussed earlier, if your Customer Success team communicates regularly with your customers you probably don’t have to worry about setting up a separate meeting for this. Your CST can bring up a conversation about contract renewal on one of the touch-base calls that it has. Churn Rate — the annual percentage rate at which customers stop subscribing to a service. LEARN MORE: Tom Tunguz wrote an interesting post on how ServiceNow tracks churn. The sales process should be designed in a way where each stage identifies where the prospect is in the sales cycle and has specific deliverables that must be met before advancing to the next stage. By monitoring metrics of conversion on each stage, you can focus on ways to increase your sales effectiveness while building strong customer relationships, which lead to higher renewal rates. This sales funnel is a simplified example. I want to remind you that this framework is not meant to be used as a cookie cutter solution. I highly recommend Jacco’s book “BLUEPRINTS For a SaaS Sales Organization” for a more detailed and in-depth analysis. Also, we need to mention “The Sales Acceleration Formula” book by Mark Roberge as the best resource to understand HOW sales processes, goals, and workflows are changing depending on the different stages of the company. Want more on customer acquistion? Read the full article here.